The night we were at the SM Mall of Asia after our visit to the Science Discovery Center, I was able to chance upon a rare find at Booksale. 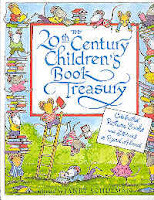 It's the "20th Century Children's Book Treasury", a collection of my favorite children's picture book and stories selected by Janet Schulman. I was supposed to be looking for a book to buy for my son but I was filled with so much excitement in my heart when I saw this. This book has almost all of the most memorable stories that I have read in my childhood and even when I was already teaching in pre-school. "Chicka Chicka Boom Boom" and "Guess How Much I Love You" is included in the selection. Ralph was quite happy with the find too because he saw "Amelia Bedelia" in the list of contents. Since the night we bought the book, he takes it from my desk to read a story or two. For a parent and a reading teacher like me, the color coding of the stories is a great tool. I get to select the appropriate story to use in a lesson because the color codes correspond to a child's age group. It's less expensive compared to buying each book in the list but the quality of each book is not compromised. All the original illustrations are included although they were made smaller. I am now in the process of making lesson plans for each story in the list. I'm glad that I was able to find this book so I can add more lesson plans to my roster of literature-based reading lessons for my students.